So far as my experience concerned, in the common terms, the real meaning of digital marketing is to promote products or brands through one or more forms of electronic media. 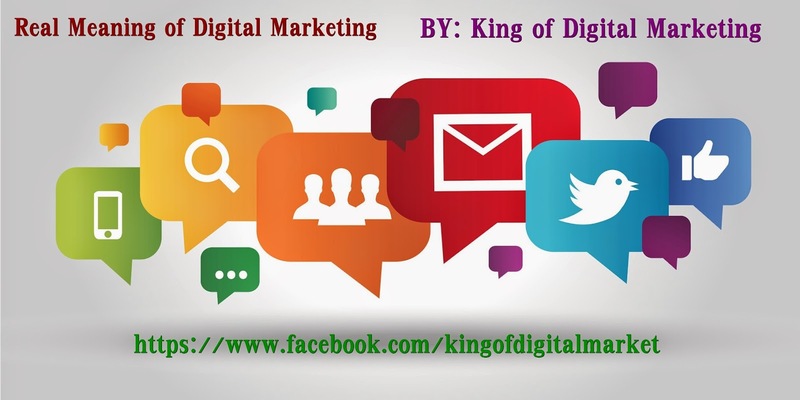 Distinguishing Digital marketing from traditional marketing in that it involves the use of channels and methods that enable an organization to analyze marketing campaigns and evaluate what is working properly and what is needed to improve for better working typically in real time. The representative of Digital marketers handle and monitors things like what is being viewed, how often and for how long, sales conversions, what content works and doesn't work, etc. While the Internet is, perhaps, the channel most closely associated with digital marketing, others include wireless text messaging, mobile instant messaging, mobile apps, podcast, electronic billboards, digital television and radio channels, etc. What are challenges in Digital marketing? Well, during the marketing through Digital media sometimes marketers have to face the following problems, basically these are challenges of marketers see the following challenges. Proliferation of digital channels: Consumers use multiple digital channels and a variety of devices that use different protocols, specifications and interfaces – and they interact with those devices in different ways and for different purposes. Intensifying competition: Digital channels are relatively cheap, compared with traditional media, making them within reach of practically every business of every size. As a result, it’s becoming a lot harder to capture consumers’ attention. Exploding data volumes: Consumers leave behind a huge trail of data in digital channels. It’s extremely difficult to get a handle on all that data, as well as find the right data within exploding data volumes that can help you make the right decisions. 1. Manage complex customer relationships across a variety of channels – both digital and traditional. 2. Respond to and initiate dynamic customer interactions. 3. Extract value from big data to make better decisions faster. Don't build only a ‪website, ‎Experience it Build a website with always keep in mind these key ideas to get promoted your website in search engine. Thanks for ur sharing,,, great info about digital marketing .. Very effective blog Searching for a SEO company in Chennai that can bring your brand to the top results page on Google.